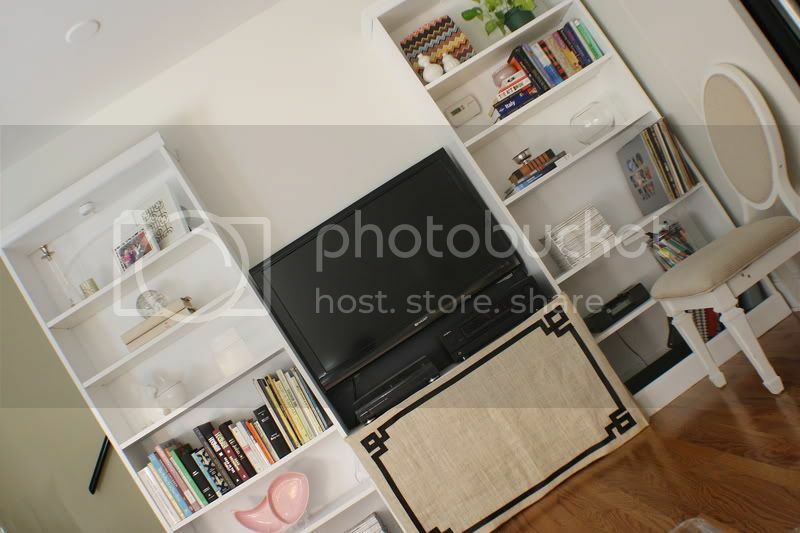 Kristen F. Davis Designs: White Bookshelves! Well, I painted my bookshelves white. It was a (way too) long process- it took about 4+ coats of white paint to get the job done. I am loving the bright and airy result, though. The shelves are not done being arranged. 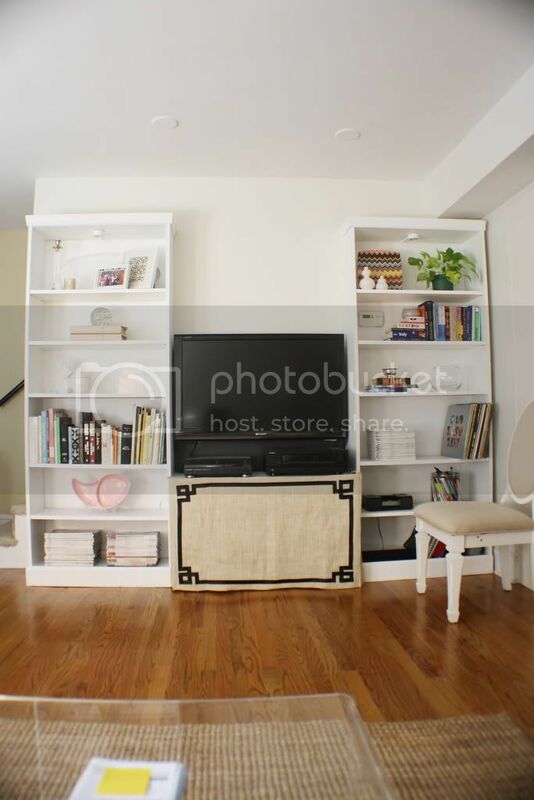 I am going to be making some more changes in my living room, and I will definitely be re-arranging the things on the shelves -- I don't like the placement of things now, but I haven't had a lot of time to play around with it. Arranging things on bookshelves is one of my favorite hobbies. Nerd! to see photos of when my dad and I did the "install" of the shelves, go here. to see photos of when I added trim to my shelves, check it out here. It really looks fantastic. I am so glad you did this because my bookcases are all white and everyone is always telling me to paint the back but I like them just the way they are! I'm loving the lighter feel of your living room now! Just in time for Spring! Are the shelves on your bookshelf adjustable? That's so cool! I am constantly rearranging my shelves and trying out new looks. yes, they're adjustable, except for the very middle one. 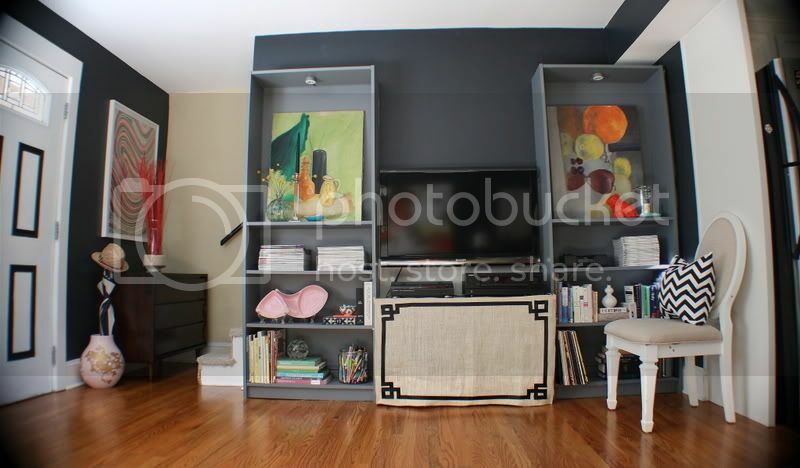 they're ikea billy bookshelves! they always look slightly uneven though, just because of not being able to adjust the middle shelf. Love the light, bright shelves! Looking good, white and light. Love it! anon - yes! i did make it. i did a tutorial on it somewhere, a while back. maybe search in my search bar? LOVE IT! such a drastic change. you make me want to be brave enough to paint my ikea stuff. do you sand them prime with kilz (sp?) then paint? It looks so good! I seriously love white! I love your blog and your work and I'm your newest follower!